"Say it ain't so, Sweetie!" Poor little birdies. Such a good photo. I took a very similar shot down the road here 3 days ago! Those birds weren't cold, but they were uncooperative, moved at the crucial moment and then flew off. 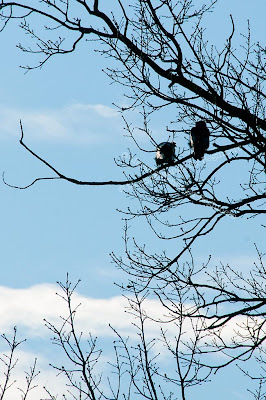 Actually, this was the first time that I caught two birds sitting on that branch. 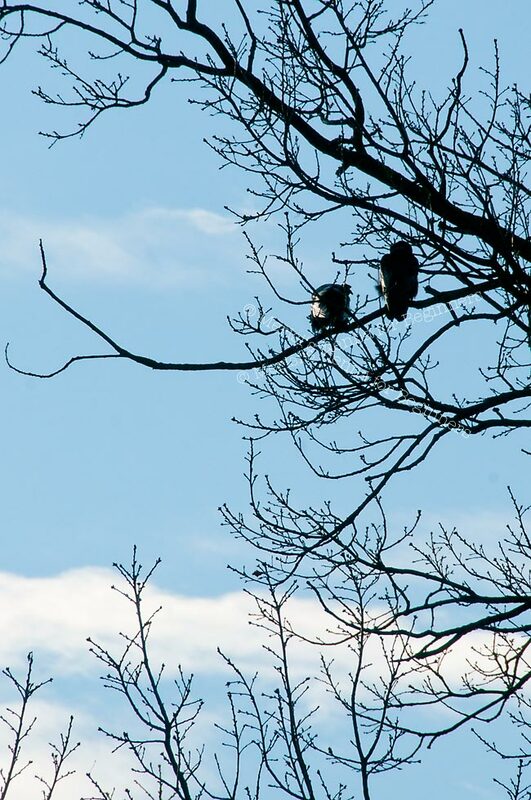 Usually, on one bird is sitting on that branch, every morning, ruling alone, the whole huge tree. hihihi, I have two of those on a tree next to our house too :)). I hope the sun shine and warms their souls. The sun will come again. I used to sleep in on cold days. Now I wake up early anyway. Getting old is hell. :) Hope the little birdies were fine. hehehehe Maybe they should flew into one of those coffee house to warm up. Now I wonder you taught you about birds!! I am quite sure they are!